My Lilly is growing up so fast. 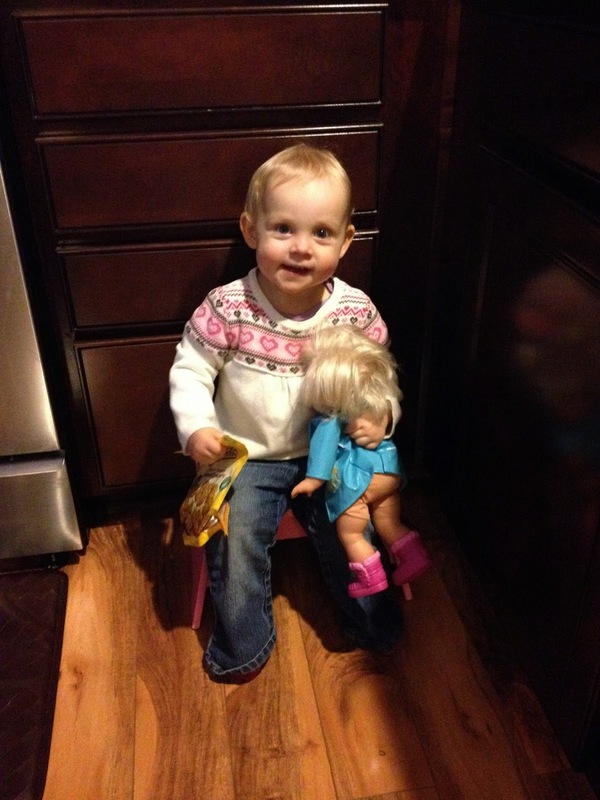 She's only 19 months and she is becoming her own little person. I watch a little boy a few days a week that is about 9 months younger then Lilly. It is so amazing to watch Lilly play with him. I have to do a double take because watching her reminds me so much of Ashley playing and taking care of Lilly! Lilly is absolutely loving being the big kid when the other baby is around. There is a change in her personality, like she is now in charge. As I sit watching the interaction, it just amazes me. While the baby was eating at the high chair, Lilly went to get his little snacks from his diaper bag and gave them to him, then she got his toy and gave him that as well! When I announced that he is all done, Lilly went and got the wipes, took one out and proceeded to try to reach his face to wipe him up. Of course she was too little and short to be able to do it, but she was really trying to take care of him, the way her sissy takes care of her. While playing in the room together this continues. She has copied many of her sissy's habits though, and will give him a toy to play with, then proceed to take it away when she sees that he is having fun with it. This baby is so great, that he doesn't cry, just goes and finds another toy to play with. Lilly will start 'cooking' in the kitchen, and bring him food that she has made, and tries to feed him. When his socks come off, she scoots around the room after him trying to get them back on, to no avail. And when he crawls over near her, she gives him a nice hug, almost to say "I'm here, I love you", just as her sister does to her. To see your baby grow up is amazing and unbelievable all at the same time. She has always been able to get away with doing things because she's the 'baby', but she's really not one anymore. Her interactions with an actual baby have shown me this. It's sad and exciting all at the same time. Sad because she's not the little bundle that we brought home from the hospital anymore, and the tiny human who relied on her parents completely for her every want and need. Exciting, though, to see her grow into this wonderful child. To see her heart come out in the things she does for others. Watching your children grow is one of the best feelings in the world!